The Mercedes C-class Cabriolet has passed the BMW 2 series and the Fiat 500C to become Europe's best-selling convertible. Mercedes will expand its European lineup to five convertibles this year. 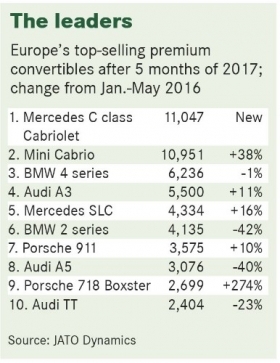 Europe's premium convertible segment is on the rise as new models from Mercedes-Benz, Mini and Porsche help to revive a sector that had been in steady decline for eight consecutive years. Demand grew last year by 18 percent to 134,113 units and in the first five months volume has risen by 8.7 percent to 67,285 cabriolets, figures from JATO Dynamics show. A big reason for the jump was the launch last June of the Mercedes C-class Cabriolet, which passed the BMW 2 series to become Europe's best-selling premium convertible through May. It also finished the period as Europe's No. 1 cabriolet overall after it easily outsold its closest volume competitor, the Fiat 500C, by more than 1,000 units. Mercedes' success is in marked contrast to the decline in demand for convertibles from volume brands. Sales in that niche have tumbled by more than 70 percent since 2007. 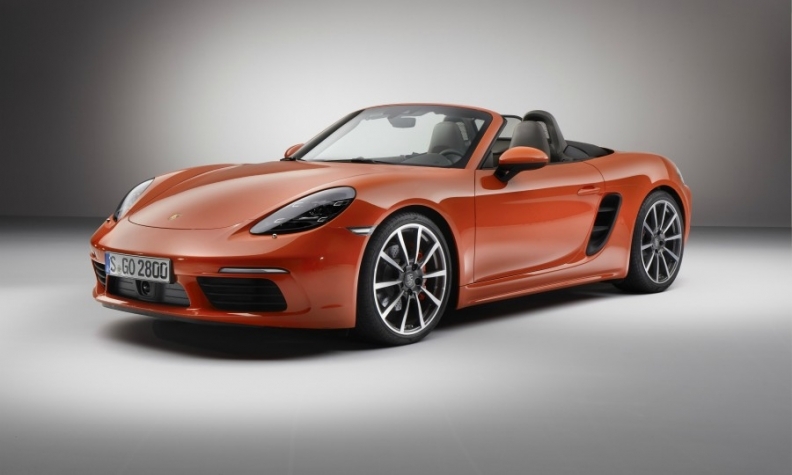 Demand for the new Porsche 718 Boxster has increased nearly 300%. 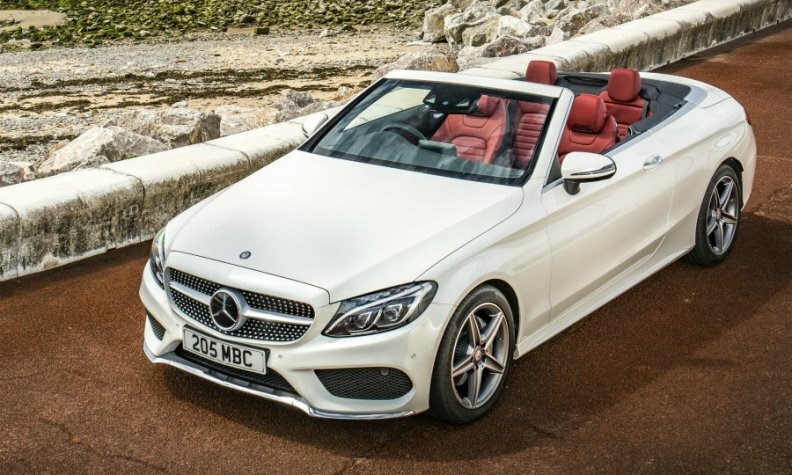 The arrival of the C-class Cabriolet boosted the number of convertibles Mercedes sells to four. The others are the two-seat SLC (formerly the SLK), SL and S-class Cabriolet. A new E-class Cabriolet, which arrives this year, will push Mercedes' open-top lineup to five. Another car that helped the sector was the new Mini Cabriolet, launched last year, which posted growth of 38 percent in the first five months of the year to take second place. Mercedes' move into the smaller four-seat sector of the market with the C-class Cabriolet has given customers an alternative to the BMW 2 series, which was down 42 percent through five months, and the Audi A5, down 40 percent. Both models have been updated. Last month, BMW started to roll out its face-lifted 2 series, which remains on a rear-wheel-drive platform. Meanwhile, sales of the all-new cabriolet version of the A5 started in March. Both models are expected to boost premium convertible sales further this year. Despite the gains, the premium manufacturers are closely assessing a market that fell nearly 40 percent between 2007 and 2015. Earlier this year, BMW brand sales boss Ian Robertson told Automotive News Europe that while BMW would retain its three convertibles, they could be among the first to go should BMW want to trim the range. "The segment isn't growing and these cars are really only of interest in Europe and the U.S. so we're keeping an eye on them, as well as a few other niche products," he said. 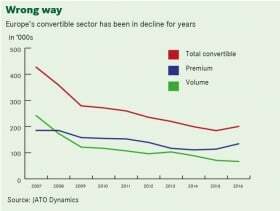 In an era when new technologies are demanding ever greater percentages of development costs, the restricted market for convertibles globally could reduce the number of models offered, but there's little chance that premium manufacturers will abandon the sector, said Felipe Munoz, who is a global analyst for JATO Dynamics. "The Germans will continue to sell their convertibles. It's a status body type that will always have a halo effect." The biggest global market for convertibles in terms of sales penetration is Switzerland, where 3.5 percent of cars sold in the first five months were open-top. Germany was second with a sales penetration of 2.8 percent, followed by Luxembourg at 2.3 percent and the UK at 1.8 percent. In the U.S., by comparison, the market penetration for convertibles in the first five months was just 1 percent. Germany was Europe's largest convertible market by volume through May with 41,359 units. Switzerland was fifth. Like they are doing in most segments, SUVs are luring car buyers away from convertible sales. "Convertibles have felt the effect of more sporty-looking SUVs. Consumers are becoming more rational even when buying sports cars," JATO’s Munoz said. Land Rover has tried to combine the two with the Range Rover Evoque Convertible -- and is having some success. With 1,990 sales through May, the open-air SUV ranked 11th in premium convertible sales, just behind the cabriolet version of the Audi TT.